A black and white large format negative of a hospital bed taken on April 30, 1950. In this view the frame of the bed is level and the mattress part is angled with the middle part being lower. 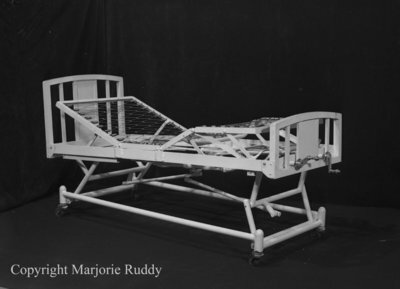 Model of Beecroft Hospital Bed, April 30, 1950, Marjorie Ruddy. Whitby Archives A2013_040_563.